Pay crew members accurately and on time. Easy and timely access to pay related details allows for accurate and auditable payroll. 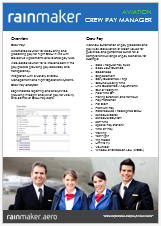 Please visit the Crew Pay Analyzer page for more details. If you would like to view a demonstration of Crew Pay Manager then please submit your contact details on the request page.